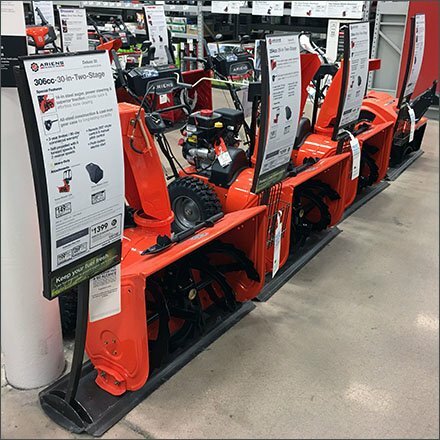 The FixturesCloseUp interest was the Seasonal Snow Blower Lineup and Rundown with detailed, descriptive signage and product information. The signage and sign holders were similar across three rows describing Ariens, Husquvana and Troy Bilt. The similarity of presentation makes comparative shopping easier … if you have an idea of how the feature offered addresses your need. I wonder if I need a single stage or two stage Snow Blower? A comparative chart might help. Browse the Seasonal Snow Blower Lineup and Rundown in the gallery of images. Scroll down for comparisons offered in other equipment lines. Seen at Lowes.